Other sites like Jetty or Secret Jepun are muck dive sites and have very little coral cover, but tons of rare macro critters. Great for macro lovers and photographers! 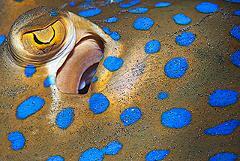 With a bit of luck, you may even encounter rhinopias, Ambon scorpionfish, velvet fish, blue-ring or mimic octopi. Mild to moderate. Usually good conditions, even for beginners. Dived be the Geko Dive Team since 2012, the Jetty dive site has quickly come to be known as a world-class dive site for macro photographers. Gili Mimpang: Three mini rock islands, slope, overhangs and walls. 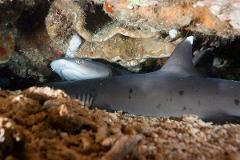 Gili Tepekong: Small island, reef slope, deep walls, rock pillars and cave (swim through). Just 15 minutes from Padang Bai's harbor by speedboat. 10:45 Surface interval on the boat. Complimentary snacks and hot beverages. Manta Point: A shallow plateau at the bottom of a sheer cliff with cleaning stations and feeding grounds frequented by manta rays on a daily basis, all year round. Interesting topography with huge boulders detached from the cliff serving as swim-throughs for divers and refuge for turtles and nurse sharks. There is a mola mola cleaning station down at 25m. Drift: Sites on the Northern side of Penida, such as Buyug, Sental, PED, SD or Toyapakeh, offer a very different feel to Manta Point. Corals thrive here in the nutrient rich, coral swept shores of the island. A plateau from 3m to 15m gives way to a sheer slope to depths few divers will reach. Divers drift with the current mostly running Southwest. 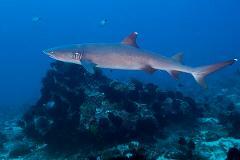 About 60 minutes from Padang Bai's harbour and the Geko Dive Base to Manta Point by speedboat. The Drift sites are much closer and the return leg of the journey takes less than 40 minutes. Manta Point: Swell from the Indian Ocean prohibits vertical growth. Some hard corals and leather corals growing close to the rock bed. Drift: Good variety of hard and soft corals, various types of gorgonians, whip corals, healthy stag horn corals and huge barrel sponges growing at an angle due to the current. Manta rays! 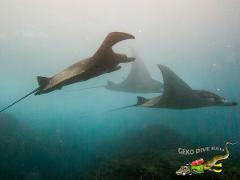 Alfredi, birostris and mobula rays frequent these waters all year round. Chances of encounters are very high with hundreds of individuals residing in these waters. Mola molas! 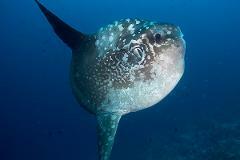 The oceanic sunfish can frequently be seen approaching Nusa Penida's reefs in order to be cleaned by banner fish. Many cleaning stations are relatively deep (25m to 40+), but the elusive fish sometimes swims shallower or even rests at the surface. These sites offer much better quality of encounters than Crystal Bay as they are larger and often less crowded. The best season to see the heaviest bony fish is July to October. Manta Point: None to mild. Here, the swell can be a challenge for inexperienced divers. Drift: Moderate to strong. Usually running in a single direction allowing for drift, but the combination of Indian and Pacific Ocean tides sometimes gives way to vertical and pulsating currents. 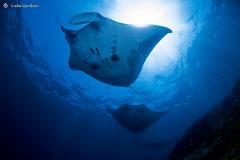 Manta rays are almost always sighted on these trips. During the July-October high season, cold water (down to 16 degrees at times) can be present. We advise divers to choose their exposure suits accordingly. 60 minutes by car from Padang Bai. 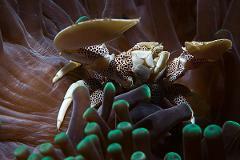 Dives to the USAT Liberty Wreck, Drop-Off, Coral Garden and Seraya dive sites start directly from the beach. The USAT Liberty Wreck lies less than 50m from shore! Mild. Usually good conditions, even for beginners. Swells are sometimes present in the dry season. The USAT Liberty shipwreck is often cited by dive magazines as one of the top 10 dives in the world. Beyond its historical value the sheer amount of life living on the wreck makes for an unforgettable experience. 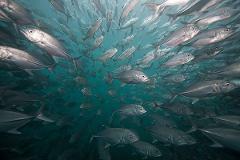 The wreck can get very crowded during high season. The Geko Dive Team departs early in order to skip the crowds on the first dive. Sites on the Northern side of Penida, such as Buyug, Sental, PED, SD or Toyapakeh, offer divers great drifting opportunities. Corals thrive here in the nutrient rich, coral swept shores of the island. A plateau from 3m to 15m gives way to a sheer slope to depths few divers will reach. Divers drift with the current mostly running Southwest. 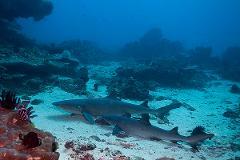 About 35 minutes from Padang Bai's harbour and the Geko Dive Base to the Drift sites. Good variety of hard and soft corals, various types of gorgonians, whip corals, healthy stag horn corals and huge barrel sponges growing at an angle due to the current. Mola molas! 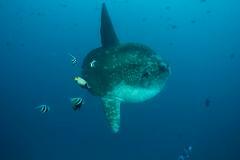 The oceanic sunfish can frequently be seen approaching Nusa Penida's reefs in order to be cleaned by banner fish. Many cleaning stations are relatively deep (25m to 40+), but the elusive fish sometimes swims shallower or even rests at the surface. The best season to see the heaviest bony fish is July to October. Moderate to strong. Usually running in a single direction allowing for drift, but the combination of Indian and Pacific Ocean tides sometimes gives way to vertical and pulsating currents. Very strong currents can prohibit dives at this site on a given day. The Geko Team does its best to plan ahead but the unpredictable nature of Balinese waters sometimes mean an alternative dive site must be chosen once on site. Crystal Bay: A bay with a beautiful white sand beach and a small island with a temple in the middle. The small island is bordered by a plateau with great corals on all sides except the Northern edge where a current swept wall leads to extreme depths. 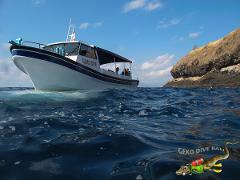 About 50 minutes from Padang Bai's harbour and the Geko Dive Base to Crystal Bay by speedboat. The Drift sites are much closer and the return leg of the journey takes less than 40 minutes. Crystal Bay: Great corals on both sides of the bay with a huge coral bommie at 6m. On the wall, some corals are unfortunately damaged by careless divers in search of the sunfish. The middle of the bay is a white sand area. Crystal Bay: Moderate to very strong. Can run in multiple directions during a single dive. The wall area is only suitable for experienced current divers. During the July-October, the presence of numerous divers and the cold water (down to 16 degrees at times) add to the challenging nature of this dive site. 11:15 Surface interval on the boat. Complimentary snacks and hot beverages. Small gili / island just 15 meters off shore, shallow bay (14m) and deep slope (40m). 1 hour by boat from Padang Bai up the east coast of Bali. Excellent variety and number of hard and soft corals, big coral bommies and table corals. This gili island has some of the best corals in Bali and Lombok. 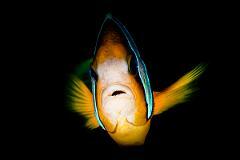 Excellent variety and numbers of reef fish, moray eels, turtles, reef sharks and... sunfish! If this program is not available on your chosen date or you'd like to arrange a different dive sites combination, please contact the Geko and we will try to help. 08:15 Sign in and equipment preparation. Long briefing with a review of equipment assembly procedures. 08:30 Boat departure and first dive following an extensive briefing reviewing entry and emergency procedures along with skills to be practiced on the dive.